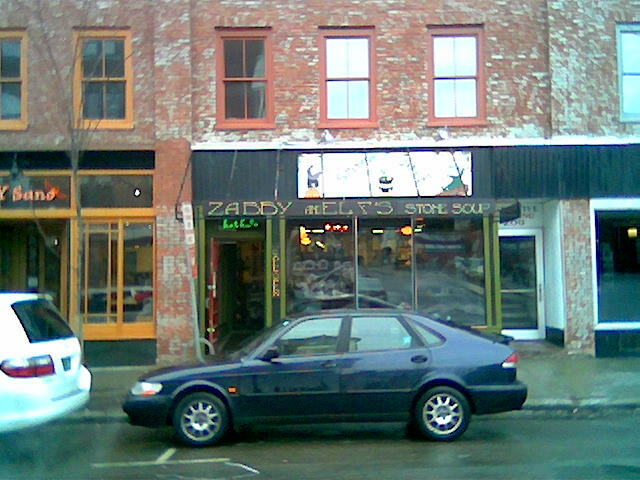 So where we left off from the last post, I was still looking for some lunch after some miss-cues and I decided on Zabby and Elf’s Stone Soup on College St in Burlington Vermont. They are next door to Bueno Y Sano. 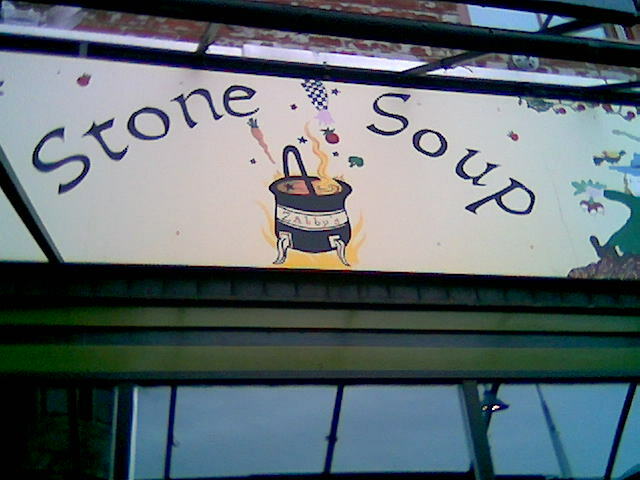 The detail on the sign helps clue you in into the whimsical nature of this business if you missed the titular reference to the classic fable of “Stone Soup“. I had pictured this place to be a clicky crunchy hangout, but was elated to find delicious food and healthy-hip ambiance. Similar to the fable of Stone Soup, Zabby and Elf’s feature local ingredients from the local “villagers”. In addition the bread is freshly baked and the turkey roasted in the restaurant. The sandwich is toasted in the oven, which give the bread nice crunchy outside, there is also cheese included in the sandwich resulting in some nice melt. The turkey is phenomenal: slight seasoning and pepper on the roasted turkey breast makes this sandwich sing. I haven’t had turkey this good since I went to a Winn Dixie grocery store in Florida. The kraut is fresh and is a little less pickled than I like, but it serves to not over power the juicy turkey. The thousand island / Russian dressing contained sweet pickle relish, which again I didn’t care for, but was an interesting twist and not a deal breaker. The sandwich appears to be aimed to the slightly sweet side, as well as keeping the flavor of the turkey in mind. 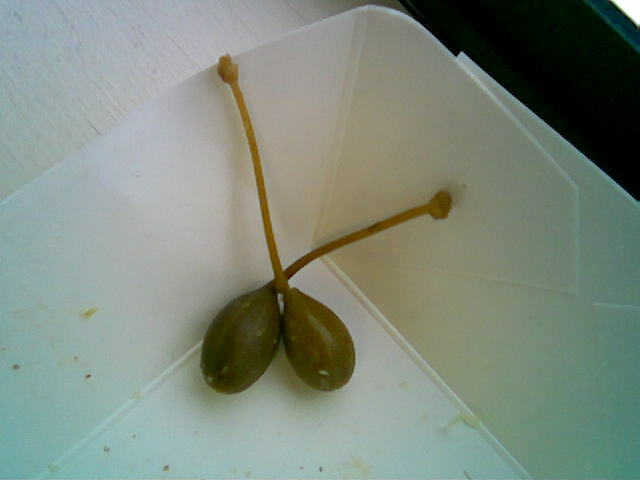 As a garnish instead of a pickle, Stone Soup users caper berries, which are the mature fruit of capers. I found these pleasantly pickle like, with a nice texture. 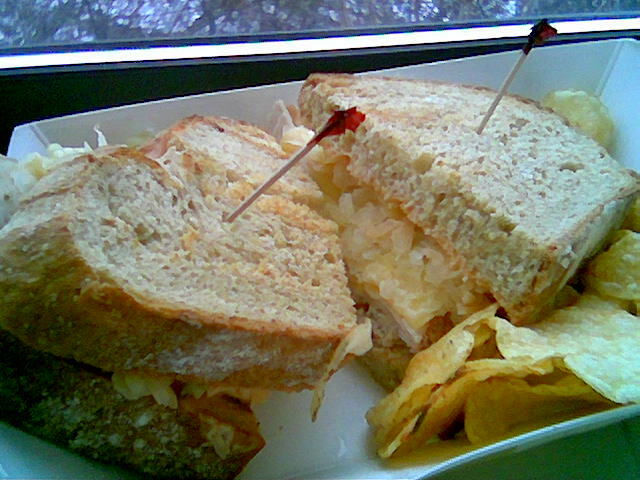 The turkey rueben includes a hand full of wonderful Mad House Munchies to round out the “localness” of this sandwich. The sandwich was just over $8 with tax. Stone Soup is CASH ONLY. This entry was posted on February 1, 2008 at 12:17 pm and is filed under Sandwiches, Uncategorized. You can follow any responses to this entry through the RSS 2.0 feed. You can leave a response, or trackback from your own site.